Topics: What did we learn from the former presentations and what can we do about it? Registration is still possible via http://tinyurl.com/ViPi-ATLEC. This event is organised with the support of the Liaison agency Flanders-Europe (vleva) and Knowledge Center Social Europe. The projects ViPi and ATLEC have been partially funded with support from the European Commission. This communication reflects the views only of the author, and the Commission cannot be held responsible for any use which may be made of the information contained therein. Memobile is an Android application which contains a set of 3 games to both teach skills to and test the skills of students on areas of the ViPi curriculum. The games are have elements to help the students learn the curriculum content, reinforce and memorise curriculum content and also to discover new information. The game uses Memo, a little cartoon boy, as a tutor for users. It is a collection of 3 games designed to help people with difficulties in memorizing the simple functions and components of computers. The games are Matching Pairs, Starter Kit and Press… and Action. The first is a game where you match pairs of computer equipment. The game first introduces the parts of a computer with brief descriptions of what they do. Matching the pairs in the game should help users to remember what the parts are and the game acts as an incentive to repeat the learning. When the user presses on a square, a component hidden underneath it will be revealed. When they press a further square, the first square will be closed unless the two components hidden below match. The idea is to memorise where the components are hidden as you go along. If you open two matching computer components in two clicks one after another, these components will remain open. The aim of the game is to match all of the pairs using as few presses as possible. After successfully completing the game the user receives a tip about one additional computer component. Then they can play again to try to improve their score or go to main menu and chose another game. The second game is one where the user has a short time to press as many on buttons as possible on the screen. The game serves to reinforce the symbol for the on button, and also has benefits in enhancing coordination in the user. 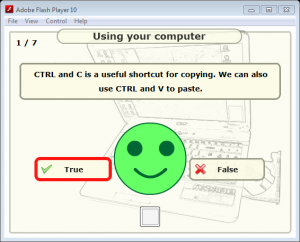 The game starts with a description of how to safely turn on and off the computer. This description is enhanced by carton style graphics showing what to press and in what order. The game then continues where the user has a short time to press start buttons and miss red crosses on a grid of icons. Pressing start buttons and missing red crosses score points. The final game, Press… and Action is a game to teach computer shortcuts. It starts with a teaching session where it explains what a number of important keyboard shortcuts can do. It then moves on to a multiple choice quiz which asks the user to identify the actions associated with a number of shortcut key combinations. The game should reinforce the student’s knowledge of keyboard shortcuts enabling them to use the computer more efficiently. The different language versions can be downloaded here (apk files): NL, EN, EL, LT.
Memobile is also available on Google Play. Stay Safe is a game designed to highlight safety issues regarding email. It covers such topics as dangerous attachments, spoofing, scams, and chain email. The game situation involves a user checking his emails and going through the received mail with an experienced computer user stood behind them. The user must make decisions (based on multiple choice questions) with each email. When wrong choices are made, the helper character will interject with advice about the way to proceed. All on-screen content (displayed as textures on the 3D monitor model) is replicated in on screen question text which can be read by the built in screen reader. The editor package built into the game allows a trainer to edit the content of the text fields and save the xml back out, so the games can be changed to suit different materials. If a trainer wishes to create new screen grabs to upload to the screen this is also possible as the files are called from an external image folder. The game is available in the four project languages of Greek English, Lithuanian and Dutch. Stay Safe is installed using the downloaded installer package (download here). The installer places a shortcut on the desktop and in the Interactive Systems NTU folder on the Start Menu. On starting the game the initial screen contains buttons to start the game, enter the options screen, or exit the application. Stay Safe has been developed using a game engine developed in house at the Interactive Systems Research Group at Nottingham Trent University. The game uses XNA for the graphics and is coded in C# calling game data from a set of editable XML files. 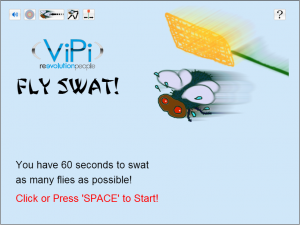 A target can be shown to give the user a better indication of where the swat will fall. 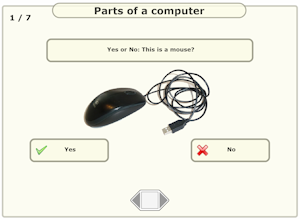 This set of games asks true/false questions about a set of ICT subject areas. The materials provided cover aspects of Basic ICT Skills in English. The content has been adjusted to suit use with people with learning difficulty. Navigation can always be achieved through use of the keyboard (arrow keys to move and space to select) or by use of the mouse. Feedback is given after each question, after each round, and at the end of the quiz. The final screen allows the user to save all feedback in the form of a pdf file. There is a downloadable version available here. This game asks true/false questions about a set of ICT subject areas. The materials provided cover aspects of Basic ICT Skills in English, Greek, Dutch and Lithuanian. Navigation can always be achieved through use of the keyboard (arrow keys to move and space to select) or by use of the mouse. 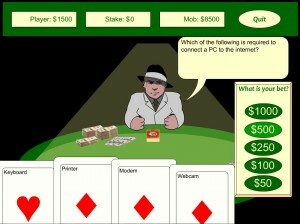 This game allows the user to play a card style multiple choice quiz betting game where they must answer questions to win the gangster’s money. The topic can be selected from a list by the player so that they can work on a specific subject area. Navigation can always be achieved through use of the keyboard or by use of the mouse. Feedback is given after any wrong answers to educate whilst playing! Play the game online here. The materials provided cover aspects of Basic ICT Skills in English, Greek, Dutch and Lithuanian. The offline version of the game (download it here) is also editable, so trainers can easily add their own question content for their specific set of trainees, content is added in the form of xml files which may be created with the help of the Escapology and Rob the Mob game editor. It comes as a packaged zip file with the editor and also the Escapology game. Please unzip the files into a folder of your choice to play the offline games. This Flash game allows the user to play a hangman style game where they must guess words relating to a certain topic. The topic and sub-topic can be selected by the user so that they can work on a specific subject area. Navigation can always be achieved through use of the keyboard or by use of the mouse. Feedback is given after each question, and every question word has an associated clue that hints at the answer to the hangman game. The offline version of the game (download it here) is also editable, so trainers can easily add their own question content for their specific set of trainees, content is added in the form of xml files which may be created with the help of the Escapology and Rob the Mob game editor. It comes a a packaged zip file with the editor and also the Rob the Mob game. Please unzip the files into a folder of your choice to play the offline games. The project “Serious Games for Social & Creativity Competencies” is a 30 months project partially funded under the KA3 of the LLP programme. SGSCC started on 1 January 2013 and will finish by end of June 2015. The kick-off meeting of all project partners will take place on 7-8 February 2013 in Plovdiv, Bulgaria. 1/ single player mode – to allow users to experience a pre-authored social competence scenario. 2/ machine mode: These are short non-interactive outcomes from single player mode choices that portray the result of a certain choice. Players are then offered the opportunity to replay the last single player mode sequence or to move on to the next. 3/ multiplayer mode – allowing multiple simultaneous users to engage in role-playing social competence scenarios to explore differences, conflicts & ultimately to find resolutions. Each game can be recorded for future play back,& therefore become the source for more single player, & machine social competence scenarios. Hence the system grows over time, & is user-authored. Learners will be faced with our contextualized, ill-structured problems & asked to investigate social competence over meaningful solutions that will directly feed into the games modes. For the game play we would use a contemporary 3D gaming environment populated by user-driven characters, & non- player characters to create a range of realistic & engaging SC scenarios. External evaluation will play a central role in the project, providing continued advice and feedback on project activities and outputs throughout. – To ensure the project is producing quality products and materials which are targeted to the end users. – To evaluate the on-going impact and end impact of the project to the direct target groups, project stakeholders and its reflection to national and EU policies. – To feedback into project development formative evaluation findings. – To monitor project activities, outcomes, processes and partnership relationships. – To analyse the impact of project outcomes through external evaluation component. – To monitor impact of the project’s dissemination and exploitation strategy. The offer submitted should include estimation of travel (by cheapest means of transport, no business class allowed) and subsistence costs (actual costs based on supporting documents) to attend all the meetings and the working days necessary to achieve all the tasks for the external evaluator. TEMPLATE TO ANSWER THE INVITATION TO TENDER. PhoenixKM (Belgium) coordinates the ViPi project that aims to provide a “one-stop-shop” interactive portal & learning environment, targeted towards trainers and trainees, with particular attention towards people with disabilities. The project partnership brings together organizations and companies from Belgium, Cyprus, Greece, UK and Lithuania. BELGIUM, BRUSSELS – 26 January 2011 – An estimated 45 million people in Europe have a long-standing health problem or disability (LSHPD), being 16% of men and women aged 16-64 in the EU as a whole (2002 EU Labour Force Survey (LFS) and the 2004 EU Statistics on Incomes and Living Conditions). 33% of the people with LSHPD are not restricted in the kind or amount of work they could do or their mobility to and from work. Figures vary largely across EU members (10-50%). This difference is directly linked to the level of prosperity and the assistance available. Of those that are considerably restricted in their ability to work, 28% were in employment, while for those that are not restricted in their ability to work, this is estimated at 68%. Today the fast development of Information and Communication Technologies (ICT) provides alternative and creative solutions for the employment of people with disabilities. Recent studies conducted by various projects such as ACCESSIBLE and AEGIS have highlighted that people with disabilities (PwD) can benefit enormously from digital competences which are core life and employability skills (see Lisbon Objectives). However, same and other studies revealed also that the main barrier is the lack of specific training support or material. In addition to that, a number of other skills such as literacy and numeracy skills equally form a potential barrier towards employment of PwD. ViPi project envisages fulfilling the gap of accessible and flexible training, designed to meet the specific needs of people with disabilities, as well as the trainers themselves. ViPi project will develop an interactive online platform where people with disabilities can access a wide variety of ICT training courses and serious games for acquiring ICT skills, while trainers will be able to upload and download specific learning objects, using a semantically enriched environment to improve the searchability, thus increasing the relevance of the results obtained. ViPi platform will comprise a virtual collaborative learning environment for people with disabilities and their trainers to interact, providing a vast repository of learning objects (LOs) that focus on basic ICT literacy. This will allow people with disabilities to grasp these core skills and become able to enter or sustain their employment in the regular labour market. The platform will be enriched with intuitive and accessible mobile and Internet/PC based educational/serious games. Additionally, also a mobile Android based social application linked with ViPi platform will be deployed. Furthermore, ViPi will also develop a customized and localized curriculum on ICT skills and training, with various additional training materials (different formats), and a trainer handbook. All project outcomes will initially be available in Dutch, English, Greek and Lithuanian languages. The Project partnership consists of Steficon (Greece), Hypertech (Greece), Hiteco (Lithuania), Nottingham Trent University (the UK), and EuroCy Innovations Ltd. (Cyprus), while the Project Coordinator is PhoenixKM (Belgium). More information can be found on www.ViPi-project.eu and twitter.com/ViPi_project. The ViPi KA3 LLL project has been partially funded under the Lifelong Learning program, subprogramme KA3 ICT.